R.G.M Motors is a Mail Order Business situated on the fringe of the Lake District in the North of England. We distribute Norton parts world wide on a daily basis. Established over 30 years ago and with what is probably the world's largest stock of Norton spares in stock, you can depend on us for a quick and reliable service. Our latest Catalogue (No. 30) is now available, with more parts, more pages and more pictures than ever before. We will happily send you a copy free of charge. (Please click on link below). 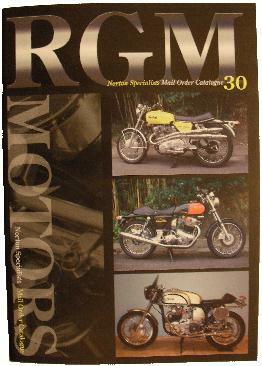 Our Catalogue covers all Norton's but is primarily aimed at Commandoes, Dommie's and the road going Singles. We are responsible for the re-manufacture of thousands of parts to original or improved specification. Our aim is to constantly increase our range and depth of stock. When using the Online Catalogue there are a couple of points to note. Some computers will identify the view cart page as a pop up, please allow. When checking out and filling in the address details etc. you will be asked for a customer number, if this is the first time you have dealt with us you will not yet have a customer number (this is issued when we enter you and your order on our system) just enter Customer Code 0000. Ditto if you have a customer number but have forgotten it. You will find your customer number on the top right side of your invoice. Please remember our site is safe and secure any information you enter on the Check Out page is only available to our Sales Department. and guide you with all your requirements. With over 5,000 lines and 75,000 individual items in stock ranging from Engine Spares, standard and competition, gearboxes and spares including close ratio, manuals, parts books, general books, silencers and exhaust pipes, engine plates, belt drives, twin leaders, floating discs, master cylinder re-line kits, Grimeca and Lockheed parts, Dunlop and Avon tyres, Venhill cables, a wide range of seats and seat covers, magneto conversions, complete clutches, special tools, petrol tanks, cycle parts, cafe racer parts, oil tanks, amal carbs, renolds chains, (and Regina) Lucas electrics, electronic ignitions, tacho gearboxes, alternator conversions, K & N oil filters, Silkolene oil, RGM's own range of special parts, hundreds of stainless items, clothing, posters and other memorabilia. We are sure to be able to help.